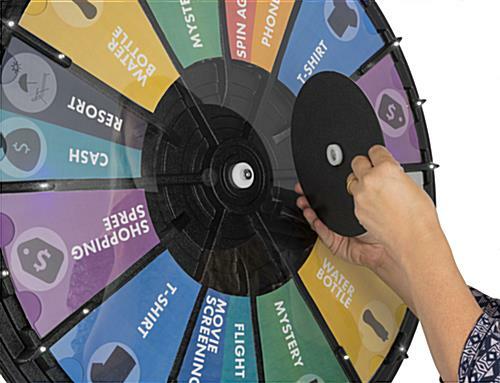 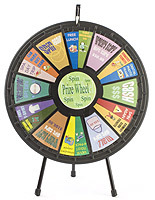 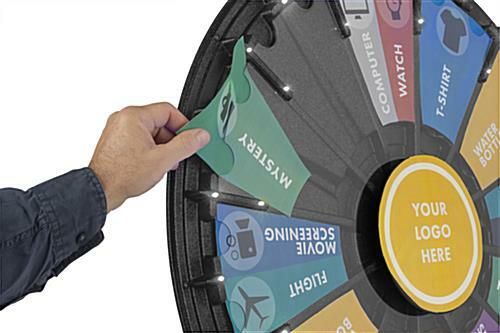 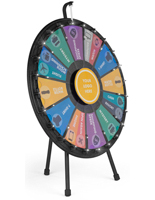 This convertible LED prize spin wheel is ideal for use in corporate offices, at trade shows and other promotional events, and for business or organization advertising. 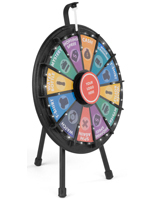 Each 31" diameter fixture can be set to have between 12 and 24 slots with built-in battery-operated multi-colored flashing lights for increased cusotmer attraction. 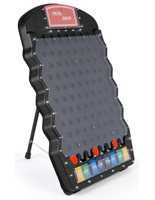 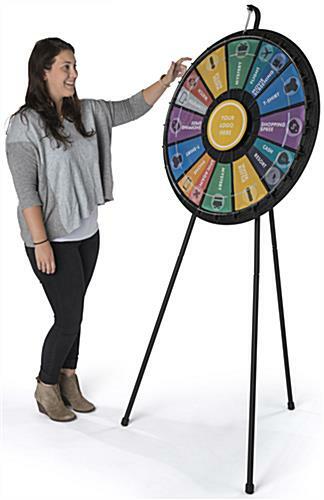 This large LED prize spin wheel for tabletop or floor standing display has 3 tripod-style legs that can be adjusted in height or removed completely, allowing it to serve as a floor-standing or tabletop fixture as desired. 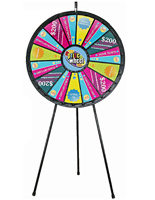 This brightly colored spinner is a perfect way to attract the attention of visitors, employees, customers, and passers-by in office or business environments, at fundraising activities, and at trade shows or promotional events. 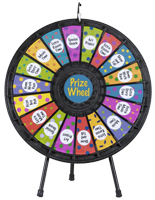 This customizable 31" LED prize spin wheel with adjustable legs and battery-operated multicolored lighting comes with free access to prize-slot and center logo templates that can be used as many times as needed for custom selections. 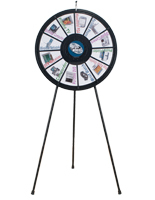 Each trade show or promotional accessory comes with 6 AAA batteries to power the lights as well as three stickers that can be used for the center plate. 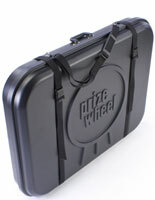 Please note: This unit is compatible with our hardshell PWCASE31 carrying case.